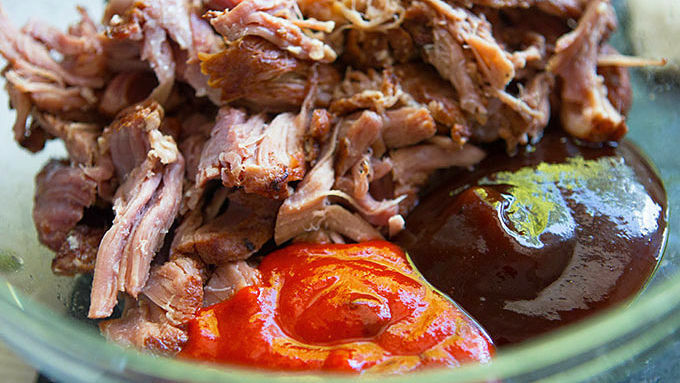 In a large bowl, stir together meat, barbecue sauce, and sriracha. Heat in microwave until hot, about 2 minutes. In a second bowl, stir together coleslaw, mayonnaise, vinegar, and honey, and cilantro. Set aside. Open Pillsbury™ biscuits. Sprinkle a clean workspace with 1/2 tablespoon of flour. Roll each biscuit out into a flat round, about 1/4-inch thick. Spray a large skillet generously with nonstick baking spray. Heat skillet over medium-low heat. 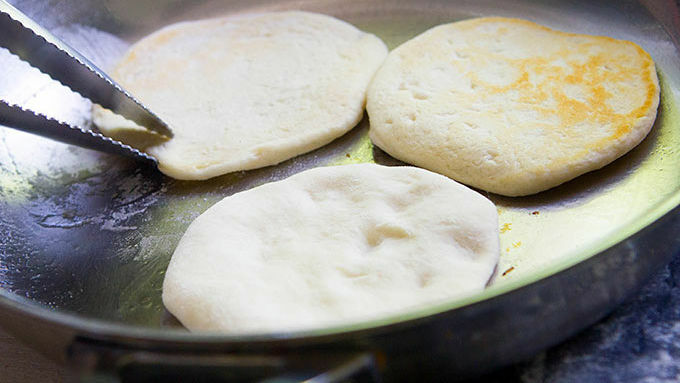 Place biscuits in hot skillet. You should be able to cook about 3 biscuits at a time. Flip biscuit rounds with metal tongs once the bottoms have turned a light, golden brown. Cook the second side. Remove and place on a plate until ready to serve. Top biscuit-rounds with meat and coleslaw mixture. 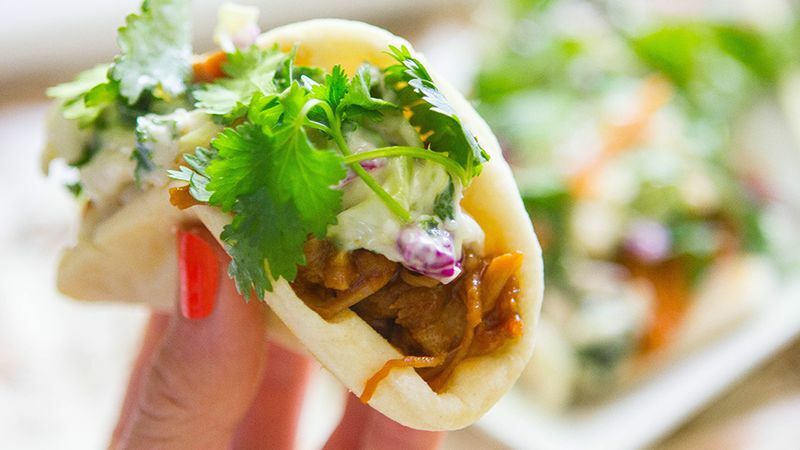 Fold like a taco, serve immediately and enjoy! 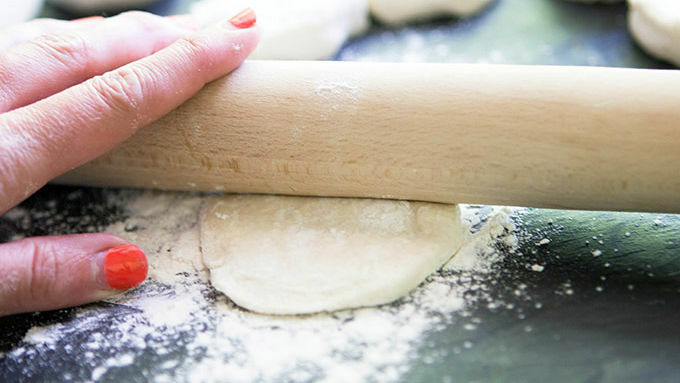 Simple bread-y shells hold banh mi ingredients that will make you swoon. Just down the street from my boyfriend’s house is a bustling street corner where a coffee shop, a gelato shop, and a divine little party gag store sit. On lucky days, an Asian-Inspired food truck also sits at the street corner. The food truck owner is a pixie of a woman, with tiny shoulders and a fierce pixie cut. Fringe bangs finish her style. She is endlessly cool, and the food she serves is endlessly cooler. On the days when she doesn’t park in the corner, I find myself with a mad penchant for Asian tacos. Just a few tiny little bites, so I feel as though I’ve had a party just for me. Now I don’t have to wait for her to park her shiny food truck at the corner of 9th and 9th. 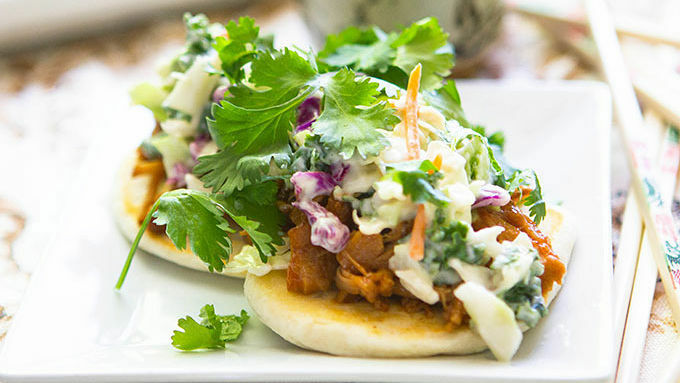 Because this quick and easy homemade Banh Mi-ni Tacos recipe is easssssy. And quick. Gourmet perfection in 15 minutes, without leaving the comfort of your own kitchen.